Reckweg 103 Women Care Pack contains Dr. Reckeweg R75 Labour Pains and Menstrual Cramps Drop and Dr. Reckeweg Magnesium Phosph Biochemic Tablet 6X. It is used in Dysmenorrhoea, Cramping pains, Labour pains. - In dysmenorrhoea give 10-15 drops in some water 2-3 times a day over longer periods. Magnesium Phosphoricum is an excellent Anti Spasmodic. It contains the mineral magnesium which is rewired by the body for a number of reactions. This magnesium is quickly absorbed by the body for use.It is used in cases when patient complaining of a headache worse after mental pressure, Headache from cold, Migraines, vertigo on moving, falls forward on closing eyes, better walking in open air. Sensation as if contents were liquid as if parts of the brain were changing places, as of a cap on head. 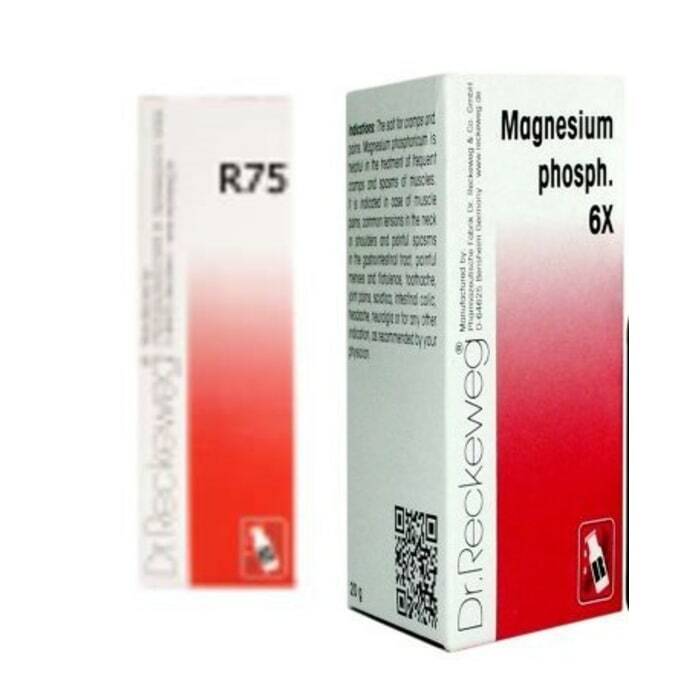 A licensed pharmacy from your nearest location will deliver Dr. Reckeweg Women Care Combo (R75 + Magnesium Phosph Biochemic Tablet 6X). Once the pharmacy accepts your order, the details of the pharmacy will be shared with you. Acceptance of your order is based on the validity of your prescription and the availability of this medicine.